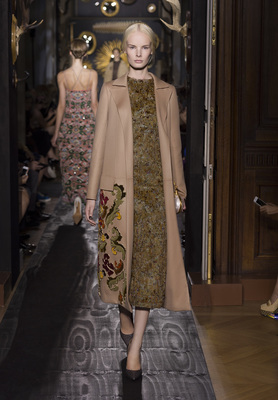 Valentino Fall 2013 Couture Collection . 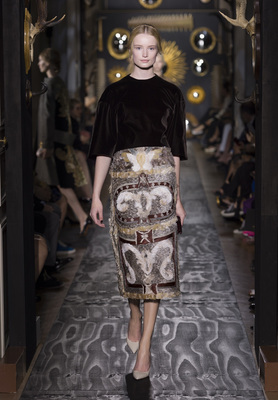 The latest Valentino fall 2013 couture collection seemed ripped out of a page of glamorous fashion history. 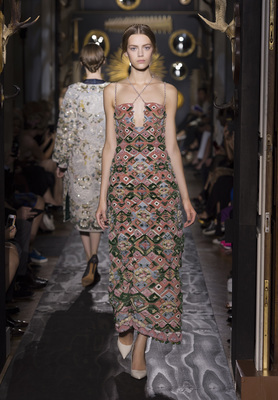 While some couturiers prefer envisioning the future, others find a never-ending supply of ideas in the past most glamorous eras and Valentino is definitely one label that thrives on finding amazing ways to recreate the past. 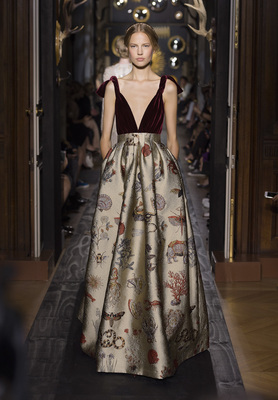 For the fall 2013 Valentino couture collection designers Maria Grazia Chiuri and Pierpaolo Piccioli elaborated on the concept of "Wunderkammer", a tradition specific to seventeenth and eighteenth century when aristocratic collections had a 'cabinet of curiosities' filled with exotic specimens and archaeological oddities. "In a cabinet of curiosities, the pieces are very unique, very one-of-a-kind. We've tried to make something that is not only special, but also surprising, unexpected," designer Pierpaolo Piccioli explained. 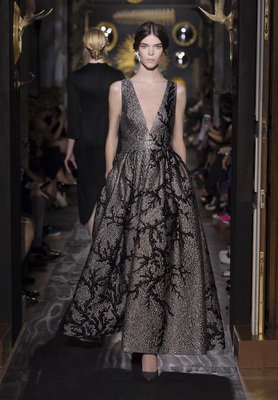 With gowns requiring upwards of 800 hours of handwork, 2000 freshwater pearls and luxurious neo-classical and baroque influences, the Valentino couture fall 2013 collection managed to be everything its creators hoped it would be, demonstrating the complex laws and ideologies that stand behind haute couture creations and which set them aside from any other type of lines. 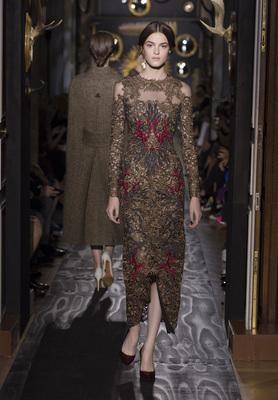 Femininity and refinement were taken to new heights in the new Valentino fall 2013 couture collection. 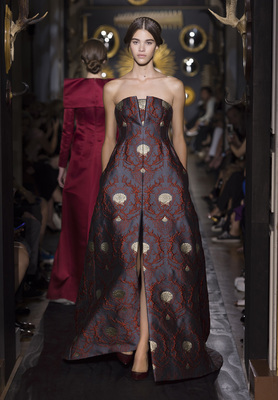 Incredibly ornate, beautifully structured yet surprisingly dainty, the Valentino 2013 couture dresses were fit for royalties. The eclectic theme was reflected through unexpected motifs like scallop shells, coral, and fragments of ancient roman carvings. Though Renaissance inspired gowns seemed fit for royal parties only, the label also brought elegant daywear alternatives for the first time. 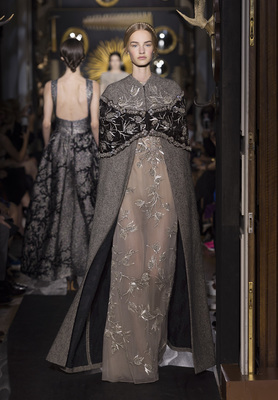 "We believe that couture can be a private luxury—not just for the red carpet or special occasions. 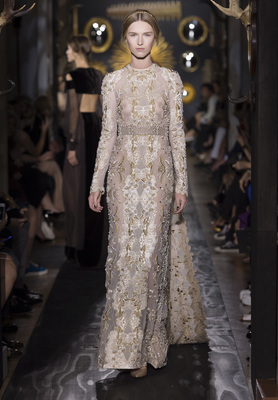 So we wanted to really work on daywear for the first time," Maria Grazia Chiuri explained. 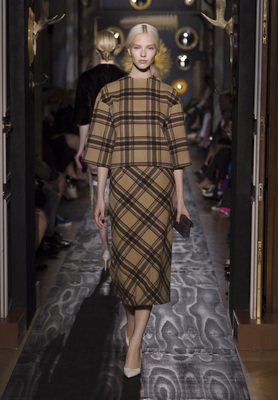 Naturally, in the eclectic spirit of the Valentino fall 2013 couture collection, not one of the elegant daytime looks could really be described as subdued as even the more modern monochrome pieces included in the line seemed taken out of a wonderful fairytale where attending formal dances is the protagonists' main concern. 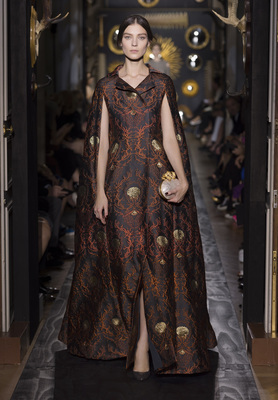 Stunning and extravagant are the only two words needed to describe the latest Valentino couture 2013 dresses.